Maryam’s husband does weightlifting. The weight falls on his throat and puts him between life and death. Maryam tries to save him, but she decides to stop helping and watch her husband die. Born 1981 in Tehran, Iran. 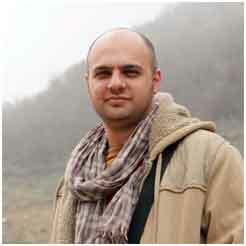 An interest in cinema led Mazaheri to begin writing film criticism for Iranian magazines after graduating from college in 2004. His first short film, Tweezers (2007). To date, he has made three independent short films and more than twenty short and long documentaries for some broadcasts. He is the editor and author of many projects aside from his own. Some of the films he has directed include “Soori’s Trip” (Documentary, 2009), “Labyrinth” (Docudrama Series, 2013, 15 Episodes), “Cockroach” (Fiction Short, 2015) and “A report about Mina” (Documentary, 2015) His last documentary “A report about Mina” was official selection of many international film festivals around the world, and won “Special Mention Award” from Yamagata Documentary Film Festival (Japan 2015). Retouch (2017) won the Best Short Film at the Tribeca film festival.